Martin Sloan, like his younger brother Bernie Sloan was a very tall and skinny ruckman. He played in the Under 19s in 1982 (in Nos. 14 & 40 and played 18 games), he also played 5 reserve games that season in No. 51. Again in 1983 he was in No. 51 and played 13 of the first 14 reserve games before being cleared to Hawthorn (due to Justin Madden's arrival at Carlton) before the end of June (clearance deadline). At Hawthorn he wore guernsey No.50 whilst playing with their reserve grade team. He headed back home to Sandhurst for the 1984 season. 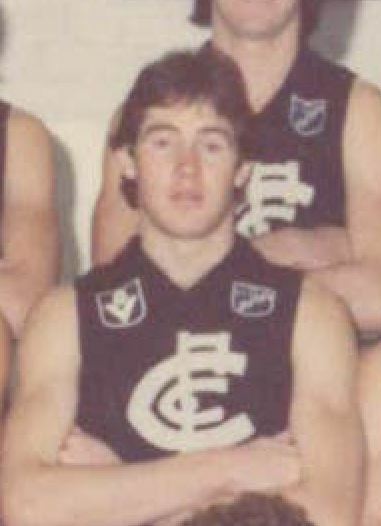 He was also captain of the Victorian Under 17s Teal Cup side in 1980 and made the 1980 All Australian team Stephen Kernahan was also an 1980 Under 17 All Australian). Page last modified on Friday 08 of March, 2019 17:26:10 AEDT by Jarusa. 1973 - The acrobatic Jezza.